The Yoga Tab 3 Pro is the latest in a line of Lenovo tablets that try to offer something a little bit different to the rest, and it comes closer than ever to fulfilling that ambition. Any new Android tablet faces a tough task getting noticed. Whereas Android smartphones have been holding their own against Apple's iPhone range for some time now, Android tablets have always been seen as second-class citizens next to the mighty iPad. Why buy a bog-standard Android tablet, with its less-desirable hardware and inferior app ecosystem, when you can pick up one of Apple's all-conquering slates from just £219 (AU$369, US$269)? Most Android tablet manufacturers have concluded that price is the key, and so a number of cheap and cheerful devices have flooded the market. Of course, the margins on the Hudl 2, Amazon Fire and the like are extremely fine, so it's not a particularly lucrative approach to take for most manufacturers. Lenovo has other ideas. With the £360 (AU$799, US$496) Yoga Tab 3 Pro, the manufacturer attempts to offer a different kind of premium design, and several features that you simply don't find elsewhere. 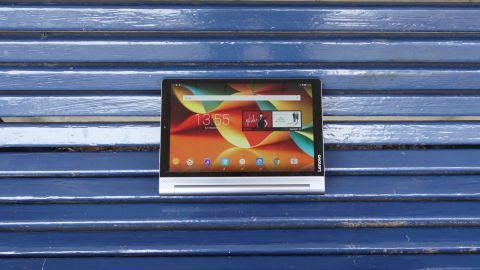 The Yoga Tab 3 Pro is Lenovo's best effort to differentiate the brand yet – but is that good enough? Lenovo hasn't radically changed the design of the Yoga Tab 3 Pro over the Yoga Tab 2 Pro, but that's okay. It still looks quite unlike anything else on the market today. Once again Lenovo has gone with a solid, premium-build device that favours feel and heft over lightweight portability. This is a tablet that's designed to be propped up on its built-in kickstand rather than held for long periods – and at 667g, you'd soon get aching arms if you attempted the latter. To that end, it's not a particularly thin device, even at its slimmest point. The flat-sided metal section of the Yoga Tab 3 Pro is roughly as thick as an iPad Air 2, but this curves out to a rounded back that adds another 50% or so to the thickness of the main body. The feeling of heft is only added to when you get to the device's natural base, a thick cylindrical section that runs along one of the tablet's longer sides. If it sounds like I'm knocking the Lenovo Yoga Tab 3 Pro's chunky design here, I'm not. I like it a lot. Superficially, it reminds me of the Sony Tablet S from way back in 2011, but whereas that tablet's book-like shape was a bit of a gimmick, here it feels intrinsic to the Yoga's appeal. This bulbous base achieves a number of things. It forms a natural handle when carrying the tablet around under your arm, as well as making it slightly more manageable on those occasions you want to hold it in portrait view. It's also this rounded section that enables all of the Yoga Tab 3 Pro's key features, which I'll discuss in greater detail in the next section. For now, I'll just mention that this weighted edge contains a kickstand, a projector, and a fabulous speaker bar. There are also two large, tactile buttons bookending this cylinder, one for power/sleep and one for activating the projector. In other words, it's no gimmick. The overall effect of this design approach is to create a device that feels like a different breed of device – or a half-breed, at least. It's as much a media-focused second screen as a tablet. As a result of this, it looks and feels quite unlike the plasticky, unappealing tablets that many associate with Android. Fortunately, the Yoga Tab 3 Pro sees this media-focused design through with an excellent 10.1-inch display. It's extremely bright, its colours are vibrant, and it benefits from a QHD resolution. That's 2560 x 1600, or 2K, which is right at the top end of current 10-inch tablet standards. This means the Yoga Tab 3 Pro's screen is significantly sharper than those of most of its rivals. Its pixel density of 299ppi places it comfortably above the iPad Air 2 and the Samsung Galaxy Tab S2, both of which are on 264ppi, and right level with the Sony Xperia Z4 Tablet.